Purpose: To reduce end breaks during the running of weaving machines and improve productivity/ quality of cloth woven. The effect of shed geometry has been studied on a loom under the combination of weaving conditions that give the best cover and least stress on loom and warp yarns determined. Crank shedding mechanisms are simple and relatively cheap to use. However, it can only be used for plain weave fabric constructions. In this system, the harnesses are controlled by the crankshaft of the weaving machine. For each crankshaft revolution, a wheel is rotated half a turn, which changes the harness position. This system is only used in air-jet and water jet machines where high speed is achieved. Cam shedding is also simple and inexpensive. A cam is a disk which has grooved or conjugated edges which correspond to the lifting plan. The lifting plan controls which harnesses are lifted. The disadvantage of cam shedding is that when the woven design has to be changed the cams have to be rearranged to suit the new design. Pattern design is also limited due to the number of harnesses the cams can control. Dobby shedding is more complex than crank and cam systems. The main advantage of dobby looms is that more intricate designs can be produced. Older dobby looms were operated by wooden lags with pegs, which rotated around a roller above the loom. The pegs in the lags correspond to the lifting plan, which controls which harnesses are lifted. Punched paper or plastic pattern cards can also be used. Recently modern dobby looms are controlled via an electronic system. The disadvantage of dobby systems is that faults are more likely to occur due to their complexity. In jacquard weaving, a device called a ‘jacquard’ selects and lifts the warp yarns individually. This type of machine is used for larger more detailed patterns, where all or most of the yarns in a repeat, move independently. There are single or double lift machines which use either mechanical or electronic systems, using CAD to control the harness lifting and lowering. 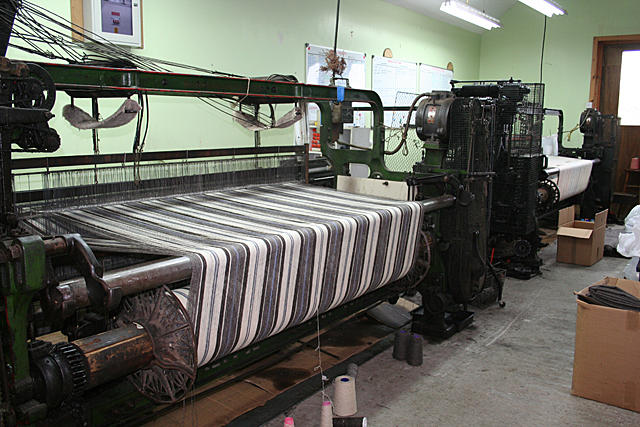 Modern jacquards are capable of handling over 1200 harness cords which control the lifting and lowering of the warp yarns. A shuttleless weaving loom in which the filling yarn is carried through the shed of warp yarns by fingerlike carriers called rapiers. There are two types of rapiers. A single long rapier that reaches across the loom’s width to carry the filling to the other side. Two small rapiers, one on each side. One rapier carries the filling yarn halfway through the shed, where it is met by the other rapier, which carries the filling the rest of the way across the loom. The insertion rate of picks can be up to 1000 m min-1. A single projectile is fired from each side of the machine alternately and requires a bilateral yarn supply. A yarn supply from one side of the machine is presented to the projectile. It carries the weft yarn across the machine and is then transported back to the other side by a conveyor chain. Several projectiles are in use at the same time to enable rapid pick insertion. Pick insertion rate can be up to 1300m min-1. In air-jet weaving machines, the filling yarn is inserted pneumatically. It is carried through the shed by compressed air flow supplied from the main nozzle and relay nozzles. This is the fastest type of weaving enabling pick insertion of 3000 m min-1. Water jet weaving is the same principle as air jet weaving, water is used instead of air and a similar speed is achieved. One disadvantage is that only hydrophobic yarns can be used. Wave shed machines carry the yarn in either straight or circular paths. Parts of the warp are in different stages of the weaving cycle at any one moment. It is possible for a series of weft carriers to move along in successive sheds in the same plane. In parallel shed machines numerous sheds are formed simultaneously. Each shed extends across the full width of the warp and moves in the warp direction.